I'm finally writing a book. I blog here. And I post to Elephant Journal. I began writing as a way to get the crazy out of my head and along the way writing became a form of meditation for me. And, like meditation, sometimes the things that come out are unexpected and even a little scary. I can't stop the words that flow. I can't not write any more than I can't not breathe. Every now and then I write something that I wonder whether I should post or not. I hesitate and worry to the point that I feel I might vomit before I hit publish. But when you bleed all over the keyboard you have to clean it up. My most recent Elephant Journal post caused quite a bit of bleeding. The emails and private messages I've received have been heart wrenching, touching and as raw as my post. So many people have shared their story with me and thanked me for being brave enough to say what they were too afraid to. By reaching out to me they have helped bandage my wounds. My new post, What Alcoholism Taught Me is the story of how yoga helped me be a better person, despite of, or even because of, the chaos around me. 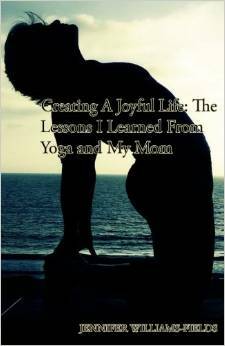 It's a small sample of what you'll read in my book "Creating A Joyful Life: The Lessons I Learned From Yoga and My Mom" - due out later this year. Cannot wait to read your book!